Cover and layout is made by Susanne and Ellen. This video will show you how to begin to interpret and use the horse's natural method of communication to develop a better relationship with your horse. 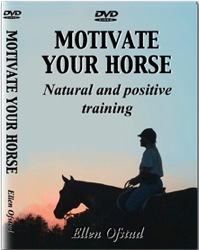 Ellen uses a reward system to teach horses new cues and responses. Using positive reinforcement to teach helps motivate the horse to learn, and keeps the horse very attentive. Common problems like horses that are difficult to catch, or horses that refuse to load in trailers will often disappear on their own when you can present things to the horse in a way the horse can understand. This video is intended for all horses and horse owners, whether the primary riding interest is dressage, jumping, driving, western riding, or trail riding. 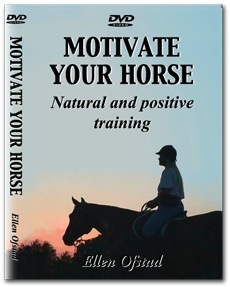 By establishing a good relationship with the horse, the horse will become a willing partner with a positive attitude. is the videos title. And it is also what the video is about. The training is based on natural communication with horses. We use body language to tell the horse what we want it to do, and because this is naturally understood by horses they quickly understand what we are asking. This video shows how to do this, and not only how to get the horse to understand what we want, but how to get the horse to want to do it. This training doesn’t require that you are some form for “horse whisperer”, or that you have some kind of special talent. All it takes is that you have an open mind, a will to learn, and the patience to take the time that it takes. 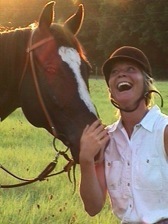 Maybe most of all they key to success is a genuine love for horses. In the video we use food rewards, and this works well when used in the right way. This is explained in the video. It is however not necessary to use food to get the kind of results as you see in the video, the important thing is to find a way to tell the horse when it is doing the right thing. Let there never be any doubt in the horse that you really care for it, and appreciate it. That you like it no matter what, even when it does mistakes. In the video we show different horses in different stages of their training. You will see when we teach Bargain, a three year old mare, to pick up the canter on a sound cue, and how that’s transferred to riding later. You get to see what really happens, the horse has not already been taught to do this, but we are filming the actual training. You will also see Princess, a three year old quarter horse being prepared for loading in the trailer, amongst other things in her groundwork. 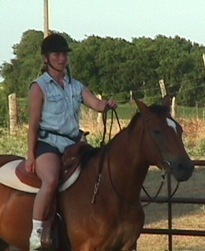 Another horse in the video is Spanky, a 5 year old thoroughbred that learns how to make a circle smaller at liberty. The point is however not what we are teaching the horses in the video, it is the way it is taught, the principles of breaking down a task into pieces the horse can understand, and how the horse is encouraged. The principles are the same whether you are teaching canter on cue, small circle or loading in a trailer.